I used to subscribe to Elle Decor but didn't renew my subscription. I wish I had for the May 2011 issue features Sarah Jessica Parker and Matthew Broderick's home in the Hamptons. Mixing and matching patterns, styles, and prices (lots from IKEA! 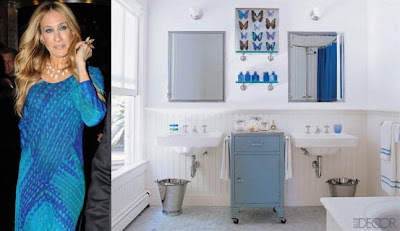 ), SJP's style really comes through in her home. I couldn't help but pair some of her fashions with rooms. This is such an amazing post!! go jaime! you nailed it with those outfit/room pairings! i just love SJP...she can do no wrong when it comes to style in my book. You amaze me with these awesome posts! what a fun little photo collage! gorgeous dresses and home to match! This is beautiful, I love the last one! This is making me wish I got that magazine! 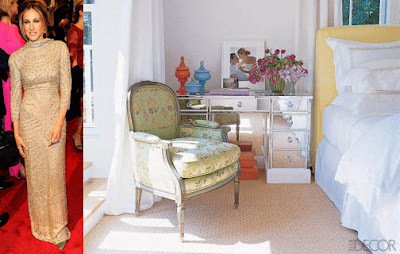 I LOVE her dress from 2004, and the chair in her master bedroom! I love all the white! Such a great idea for a post honey! Did you hear about my 1st novel release? You can check it out here: http://www.amazon.com/dp/B004YTMGA0 Have a wonderful Monday doll! Such gorgeous rooms! I just love SJP's style! the bedroom in the second pic is so dreamy! she looks amazing with that last dress! I love all the room, esp bathroom and bedroom. good lord, I would expect nothing less from her!!! love, love, love! 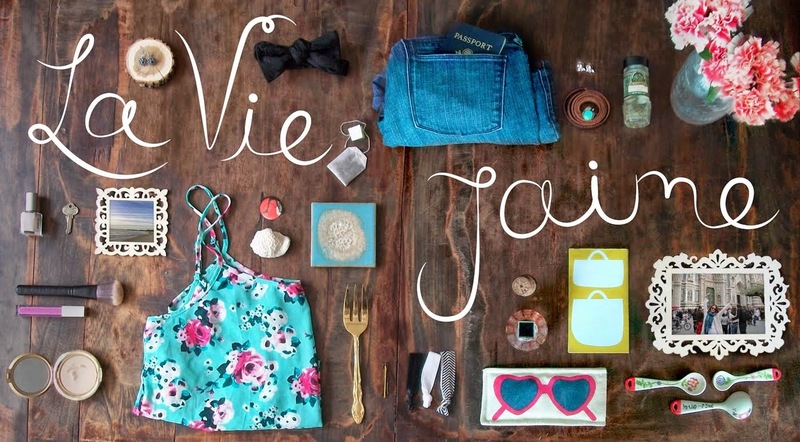 I love the inspiration collage! Hmmm maybe if I subscribe to taht magazine I'll get more inspiration for my house :) I LOVE that last picture with the window seat...so pretty!! The whole house looks so bright and airy!